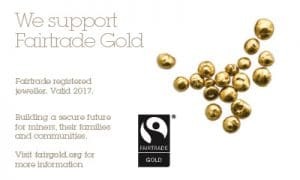 Fairtrade Certified Gold is the world’s first ethical gold which is extracted by responsible artisanal mining communities. Apart from being produced by small-scale mining cooperatives, this is also a traceable raw material with an exact origin. Jewellery with the Fairtrade Gold Stamp is very special. Buying it means you know the small-scale and artisanal miners were paid a fair price, giving them financial security.